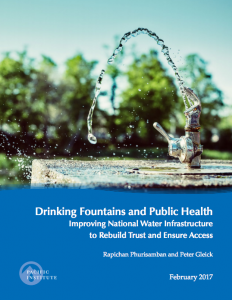 February 27, 2017, Oakland, Calif. – Today the Pacific Institute released Drinking Fountains and Public Health: Improving National Water Infrastructure to Rebuild Trust and Ensure Access, which finds limited causal evidence between illness and the use of drinking fountains. The authors note that the risk of fountain water contamination can be reduced or eliminated altogether through improved maintenance and cleaning or updating and replacing old water infrastructure. Concerns over drinking water quality and possible disease transmission as well as widely-publicized water contamination incidents have contributed to a decline in the number of publicly available water fountains. Yet many people – including children, commuters, joggers, tourists, and the homeless – rely on drinking fountains for cheap, accessible, and safe municipal water.